Ingredients: Garlic Bulb, Rosehips, Parsley Leaf, Watercress Herb & Rosemary Leaf. 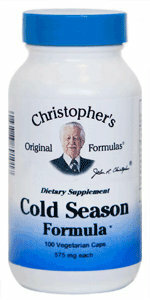 Dr. Christopher's Cold Season formula aids the body with seasonal changes & helps support immune health. Also available in Powder (Garlic, Rosehips & Parsley) Form.